Daily buffet breakfast is included for each day, prepared in our pantry kitchen or optionaly served in the comfort of your villa. You can swap your daily breakfast inclusion with a stylish floating breakfast, served with your preferred breakfast menu selections on a floating tray. Only add additional Rp 180.000 nett per person (price includes 21% tax & service charge). Didn't have a breakfast inclusion? Just get it at Rp 380.000 nett per person. Interested to this breakfast experience? Just let us know! Enjoy your lunch in a style with a tantalizing authentic Indonesian Rijsttafel menu served on a floating tray at your pool villa. Only Rp 137.500 nett per person (price includes 21% tax & service charge). Required minimum order is 2 people. Want to try this lunch style? Just book here. Breakfast/lunch/dinner menu has been developed to suit the needs of our guests that available in our Kedis Restaurant and through our room service (until 10.30 pm). An option of live cooking in the villas is available by our chef and can be made available upon request. Please contact us for request. Kedis Restaurant is located at the upper lobby level. It is designed in stylish semi open dining area and surrounded by modern wooden panels. The restaurant gets the influence of Asian ethnic decoration. A 28 seats offer a scenic view of lagoon pool to cater variety food selection; Western, Asian and including local Balinese cuisine. Enjoy our Balinese cultural night on Tuesday from 7 pm - 9.30 pm. It serves tantalizing authentic Balinese cuisine and barbeque. 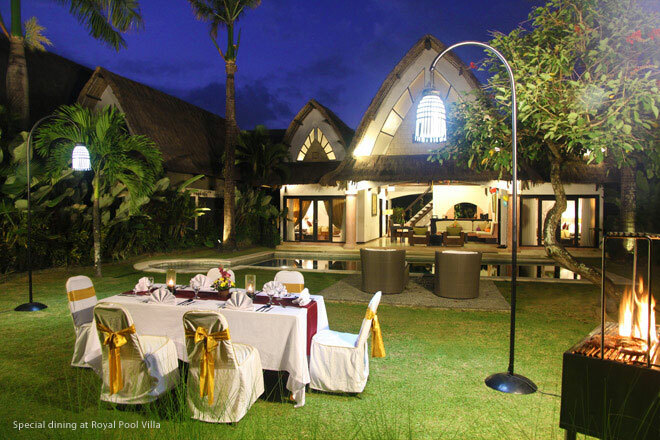 Plus, your casual dinner by Lagoon pool side will be accompanied by Balinese traditional dance performance. Only Rp 288.000 net (price includes tax & service). Contact us to for reservation. Delight your Friday night in a casual buffet dinner with a range tantalizing Indonesian dishes served in all-you-can-eat buffet and live grill. Plus, entertained by traditional Indonesian dance. Only Rp 288.000 nett (price is inclusive of 21% tax and service). Join us on Friday from 7 pm - 9.30 pm. Want to book your table? Just let us know!. Discover the secrets of Balinese and Indonesian food with our native Balinese Chef. An easy, fun and educational sessions for individual, couple, family or groups, expertly guided by our chef who will help you to learn the ingredients, the culture, and how to prepare and create an authentic Balinese and some popular Indonesian dishes. This cooking class will be take place at Pencar Authentic Balinese & Seafood Grill restaurant, located off site of Villa Seminyak Estate & Spa. More details on Cooking Class. Dining table set-up for two on the poolside of your private pool villa, a romantic setting with beautiful flower arrangements and candles. Complete with a Chef's special five-course menu that will make a night to remember. Only Rp 450.000 ++ per person (price is subject to tax and service). Contact us to for reservation. 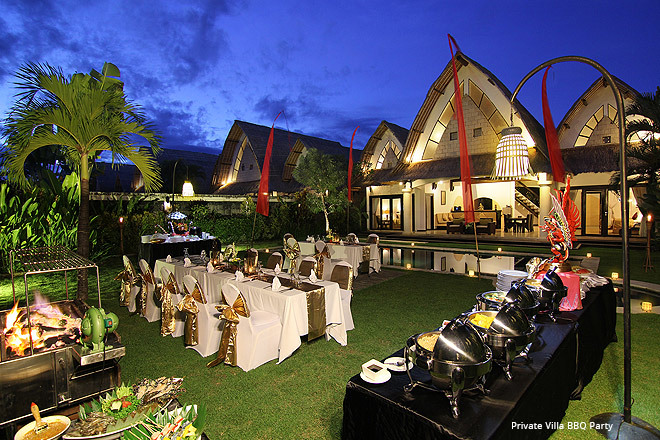 A special BBQ dinner just arranged for you and your familes or friends at private villa. It will be served in buffet style with live grill. Minimum 4 people is required for booking. Only Rp 350.000 ++ per person (price is subject to tax and service). Just contact us for any questions or reservation..
With prior notice our Food & Beverages team is available to cater to special in-villa dining requests and social gatherings with a menu of your choice. Including Wedding reception, Birthday parties/decoration, cocktail parties and private dinner. Please contact us for functions inquiries.